One aspect of commercial roofing we haven’t covered here is how flat roofs are attached, which can have an impact on the roof’s performance. At the time of your installation, your roofer should be able to explain the different methods they use. He should also be able to explain why he plans to attach your roof the way he does and how it will benefit you. All commercial flat roofing have a layer of insulation with a metal deck underneath which is fixed to the structure below: to the actual roof decking of your building. Your roofing company will evaluate which attachment method you need for the value of your building. One approach is more time-consuming and tricky than the other. Therefore, it may be more expensive than what you need for your building. 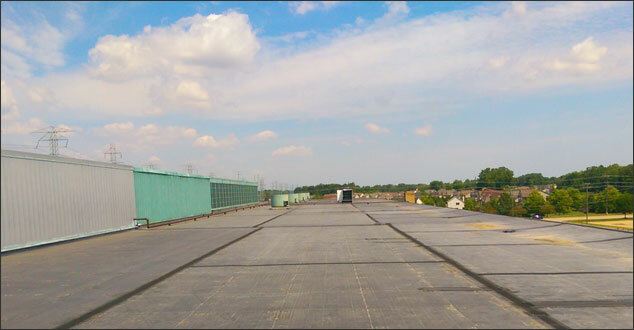 Mechanically attached flat roofs are the type used most often in commercial roofing. The reason for this is that it takes less time and manpower to install a mechanically attached roof, and they are less expensive. Also, any roofing company or inspector can come in to verify the quality of workmanship involved by looking at the fastener patterns. The membrane is rolled down and applied with screws at the edge of the membrane. The screws will go through the membrane and the insulation boards to the metal decking. Then the screws are covered with the edge of the next layer to be rolled out in succession. There are layers of membrane to be applied, which then get heat-welded together with a hot-air gun. This creates the watertight seal you need. In the end, your roofing surface will be flat and waterproof, and it will have no gaps. As you would expect from the name, a fully adhered roof is glued directly to the insulation layer below it. The insulation boards act as insulation and also to secure the outer layer to the roof deck. This method requires large quantities of glue which must be applied at the same time, and at the right temperature. It also needs to dry to the right degree of tackiness before the membrane can be applied. Once the membrane is applied, a roller is used to press the membrane to the insulation layer. The reason this method is used sometimes in place of mechanically attaching your roofing system is that most builders believe this method is less resistant to leaks. The reasoning is that where there are no penetrations like screws, it’s not as easy for water to find a way in. However, there is still the possibility for leaks with this method. Additionally, it can be harder to detect a leak if there is one, since there are no holes. Once water gets in, it can pool under the roof and degrade the glue. As a result, much larger areas of the roof will be damaged. In conclusion, mechanically attached commercial roofing systems are the most popular method. However, there are legitimate reasons your contractor may opt for a fully adhered roof. Be sure to ask about these and any other concerns you have as you plan for your next commercial roof installation. As always, if we can be of help to you in Southeast Michigan, don’t hesitate to give us a call today.